Below we take a look at Trek-Segafredo. When Segafredo joined the team as a main sponsor for the 2016 season, manager Luca Guercilena did nothing to hide that the injection of money should make it possible to build the team into one of the strongest in the peloton. Due to their late arrival, many riders already had an existing contract for 2017, and 2016 was always going to be a bit of a transition year. The big overhaul of the team was set to be put into place for the 2017 season. Guercilena has stuck to his word and has changed the team considerably. No less than 11 new riders have been signed and as only 9 will leave, the team will have a broader basis. The big change has also been made possible due to the fact that five of the riders from the 2016 season have retired and especially Fabian Cancellara’s departure frees a lot of money that could be added to the capital injection. The result is an almost completely new team and Guercilena is very ambitious. The Italian manager has been clear that his goal is to win the WorldTour and that they want to be in contention for the top positions in all three grand tours. To realize the lofty ambition of victory in the season-long competition, they need to be competitive in three-week races, one-week races and classics and the ambitious transfer campaign has clearly been designed to cover all bases. In 2016, the team was led by Bauke Mollema in the stage races and by Fabian Cancellara in the classics. The team have retained Mollema as one of their leaders and have brought in another two captains. Alberto Contador will be the second stage race leader, meaning that the team should be able to have a podium candidate in every WorldTour stage race. At the same time, John Degenkolb has been signed as a direct replacement for Cancellara. Cancellara’s shoes are hard to fill but Degenkolb is maybe the best possible substitution. Of course there are still doubts regarding the German following his bad accident last January but his performances in the second half suggest that he is on the right track. Most notably he made the split in the windy World Championships road race – at least until a mechanical took him out of contention – and this must have boosted his confidence. It is worth noting that he hasn’t been dropped on a flat cobbled section in a monument for several years and while he is maybe not as strong as Cancellara in the Flemish races, he could very well win at least one Paris-Roubaix and Milan-Sanremo while riding for his new team. At the same time, he provides the team with more victories as he can also go for sprint wins in stage races and it’s even not impossible that he can bring the rainbow jersey to the team at some point. Of course he won’t win the time trials that Cancellara did but apart from that, he has all the chances to be a worthy replacement. The team already have a solid classics roster in place and so they have done very little to bring in new riders for the cobbled races or the sprints. The team will rely on the strong guys and train they already have and only Koen De Kort has been brought in as a real reinforcement. The Dutchman has never become the classics rider he once hoped for but he is a very skillful lead-out man who has huge experience in working with Degenkolb. Matthias Brändle may also be able to provide some support but he will not be a major reinforcement for those races. Overall the loss of Stijn Devolder probably means that the team will be a bit weaker on the cobbles. The Belgian may have been a bit inconsistent and only peaking once every year but for several seasons he has been Cancellara’strongest domestique in the biggest races. For the stage races, the team will suddenly go from being a bit of an underdog to one of the major favourites. Even though he is no longer the rider he once was and is very unlikely to win the Tour, Alberto Contador won the Vuelta al Pais Vasco, would have won Paris-Nice if the hardest stage hadn’t been cancelled and was on the podium at Volta a Catalunya in 2016. Contador will always be one of the leading riders in the one-week stage races and in the grand tours and he will be able to boost their WorldTour points tally significantly. The question is whether Trek-Segafredo have the team to set Contador up for the attacking style that he likes. Bauke Mollema will have a largely separate programme to make sure that the team is competitive in all WorldTour stage races and the team haven’t signed many climbers to strengthen the group of domestiques. Only Jesus Hernandez will follow Contador and he has been riding pretty poorly for the last couple of years. André Cardoso has been added too and he should be a lot more valuable as he is known as a very consistent top 20 rider in the grand tours. However, he is not the kind of rider that can set Contador up for his attacks. 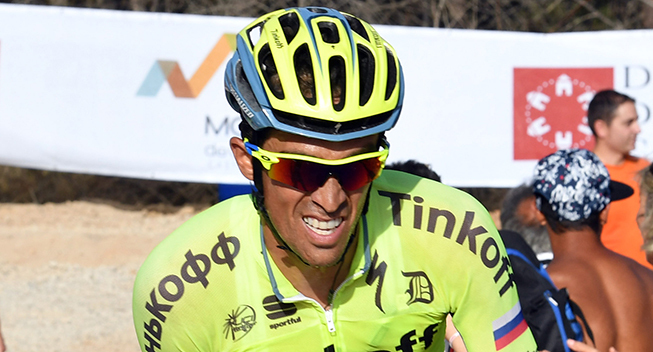 The real reinforcement in the mountains is the addition of Jarlinson Pantano. It has taken some time for the Colombian to show his real potential but his 2016 season was a real breakthrough. He was one of the hottest prospects on the transfer market as he can do almost everything. He climbs well and is very fast in the sprints which makes him valuable as a support rider in the grand tours and as a leader in the hilly one-day races. At the same time, he showed decent TT progress at the Tour de Suisse and he could become a third leader in one-week races too. The rest of the transfer campaign indicates that the team has a big focus on the development on young talents and they have created a strong structure for that purpose. The most interesting signing is Dane Mads Pedersen who won the U23 Gent-Wevelgem and rode impressively at the 3 Days of De Panne. The former Stölting rider is pretty fast too and has the potential to become a great classics rider. Michael Gogl had a good first year as a pro and deserves his spot in the team. He will probably never be a real winner but he can be a solid domestique both in the one-day races and stages races where he can handle the flats and the medium mountains. American champion Greg Daniel is a very aggressive rider but he will probably also mainly have to work as a teammate. His Axeon teammate Ruben Guerreiro will be more capable of achieving results in the long team as he climbs well and has a decent sprint which could turn him into a good rider for the cobbled races. The main loss is of course Cancellara but there is also reason to regret that Niccolo Bonifazio will go to Bahrain-Merida. The Italian took a huge step in 2016 and nearly beat Marcel Kittel in a direct battle while also picking up a WorldTour win. The team have lots of sprinters so they will have their bases covered but it is still a significant loss. Ryder Hesjedal and Frank Schleck will both retire but none of them will be missed much. The former never found his best legs with the team and the latter’s level dropped significantly in the last year of his career. The team also let Julian Arredondo and Riccardo Zoidl go. Both were huge talents when they joined the team and Arredondo initially looked to be the next big Colombian climber. Unfortunately, he has been set back by a hip injury and unless he recovers from that in his new Nippo-Vini Fantini team, the team have no reason to regret his departure. Zoidl showed signs of his promise but he never turned into the rider that he could have been. In the past, Trek-Segafredo have been perennial favourites in the cobbled races due to the presence of Fabian Cancellara while they have been less prominent in the Ardennes. With John Degenkolb replacing Cancellara as the leader for the Northern classics, the first part of the one-day campaign is again going to be the focal point of their classics season. Degenkolb will already be one of the big favourites for the first monument, Milan-Sanremo. The German won the race in his last attempt in 2015 and he has all the skills to repeat that performance. He may not be a pure sprinter but he and Alexander Kristoff have developed reputations as being the fastest at the end of long, hard races. Degenkolb is not great at positioning and this makes him more of a wildcard than the always reliable Kristoff but the German will always be one of the big favourites for Sanremo. Giacomo Nizzolo also has all the skills to win his home classic but he will probably have to play the role of plan B in 2017. On the cobbles, Degenkolb will again be the big leader and he will be the sole captain in Roubaix where he will be the favourite to win if he can get back to his best following his terrible accident. As said above, he hasn’t been dropped on a flat pave for several years and he is probably the best rider in the world for that race. However, Jasper Stuyven is also coming of age. In 2016, he won Kuurne-Brussels-Kuurne with a marvelous solo ride but he never got a chance to show what he could during the rest of the campaign where he worked as a domestique. In 2017, he will probably have more of a free role in the Flemish races and he has the potential to deliver a big result even in the major races. In addition to Stuyven and Degenkolb, the team have Nizzolo and Edward Theuns who both have expressed their desire to get a chance in the Flemish races. None of them are likely to be in podium contention in the hard races like E3 and Flanders but Theuns has already proved that he can be in the top 3 in some of the easier races. Nizzolo rode a very aggressive and very impressive race at last year’s Dwars door Vlaanderen and if he rides a bit more defensively, he can definitely win one of those smaller classics. The team will be more on the defensive in the Ardennes. On paper, there is no reason that Degenkolb can’t be competitive in the Amstel Gold Race but he will probably be fully focused on the cobbled races and will skip the Dutch classic. Bauke Mollema will have his eyes on the Giro and so will only do Liege-Bastogne-Liege. This means that it will be up to Jarlinson Pantano and Fabio Felline to lead the team in the hilly one-day races. On paper, Felline and Pantano have the skills to do well in that terrain but until now they have not had much success. However, both have improved massively during the last year and even though they are unlikely to win any of the races, they should be competitive. The team will probably have their best chance at Amstel where Felline has the speed to be on the podium. Fleche Wallonne will be the most difficult race for the team and the goal must be a top 10 finish for Pantano. For Liege, the team will have the added firepower of Mollema who has been in the top 10 in all three Ardennes classics in the past. Last year he won Clasica San Sebastian and in general he has become a lot stronger. Pantano and Felline have shown less in the very long races but Mollema can definitely be on the podium in the biggest of the hilly classics. In the autumn races, the team have Degenkolb for Hamburg and Plouay where he has been in the top 5 in the past. Nizzolo is also suited to these races but he has indicated that he wants to do the Vuelta. Mollema has been good in the Canadian races in the past but with a Giro-Tour double in his legs, he may leave the leadership role to Pantano and Felline who are even better suited to the moderately hilly courses. It may also be hard to defend his Clasica San Sebastian title even if he has always been good in that race However, the team will have to look to their Dutch leader – or maybe Contador – if they want to be really competitive in Il Lombardia unless Pantano shows that he can handle the very long distances. At the end of the 2016 season, manager Luca Guercilena stated that the team wants to be in the mix for the podium in every grand tour and that’s why they have signed Contador. In the past, it was always up to Mollema to lead the team in the stage races but with two big leaders, they can now cover all the three-week races. At the same time, the team have two top sprinters, Giacomo Nizzolo and John Degenkolb, and both of them also want some space in the grand tours. When he announced his intention to continue his career, Contador did nothing to hide that he did so with the clear objective of winning the Tour de France again. Hence, there was no way that he was going to sign for a team where he would not be the clear leader in the French race and so it was just a matter of time before the team would make the official confirmation that Mollema would have to turn his attention to the Giro. The announcement came in December when Mollema admitted that it had taken some time to come to terms with his new objective but that he is now fully focused on his quest to win the Italian grand tour. The team will go into the Giro with a clear focus on a possible victory with Mollema and it is definitely not impossible that the Dutchman can win the race. He took a massive step up at the 2016 Tour. In the first two weeks, he was one of the three best climbers in the race and he could even match Froome and Porte on Mont Ventoux. At the same time, he did the time trial of his life and so showed the versatility needed to win a grand tour. Unfortunately, he faded a bit in the final week before he lost everything due to a crash on stage 19 but the performance must have provided him with lots of confidence for the future. The main question is whether Trek can support a possible bid for an overall victory. Nizzolo has been the most consistent sprinter in the Giro for the last few years and he targets a third consecutive red jersey. The team have to devote a part of the team to his lead-out guys Boy Van Poppel, Marco Coledan and Eugenio Alafaci. At the same time, Contador will probably convince the management to save the likes of Pantano and Peter Stetina for the Tour de France as the number of climbers in the team is very limited. Felline is likely to ride his home race but he is not a pure climber. Mollema could very well be pretty isolated in the mountains. In the Tour, Contador will be the big leader but it is very hard to realistically believe in victory. The Spaniard has not been at Froome’s and Quintana’s level since 2014 and his performance in the Vuelta suggests that he is past his best. Nonetheless, he is still capable of a podium finish and his aggressive riding style will make sure that Trek get lots of publicity. He will have Mollema and Pantano for support and if Contador drops out of contention for the win, both of them may get the chance to go for a stage win in the mountains. Degenkolb has not confirmed that he will do the race but it is hard to imagine that he will skip it. One of his big career goals is still to get that elusive stage win and he will probably line up for the German start in Dusseldorf. However, there will be less support than usual for him in the sprints and it won’t be any easier for him to get that victory than it was at Giant. The team have not said anything about their Vuelta plans but with their desire to be competitive in all grand tours, it seems very unlikely that Contador won’t go for victory there. Again he will be up again Froome and probably Quintana and so it will be very difficult to do better than a podium finish. At the same time, it is unlikely that he will have the same kind of support. Mollema will be absent and Contador will probably have to rely on Felline and maybe Pantano in the mountains. The team should also bring one of their sprinters to the race. Degenkolb has won a lot there in the past and must be keen to return. However, the hillier race also suits Nizzolo well and both of them can win more than one stage there. Nizzolo has made it clear that he wants to make his debut in the race but it remains to be seen how Degenkolb looks at that choice. In any case, Trek should have one of the fastest sprinters in the race. As said, the team hope to win the WorldTour and that’s only possible if they are competitive in most of the one-week stage races. The plan is that Mollema and Contador will ride a bit together in the early season and then have separates schedule for the big races during the spring. Riders like Jarlinson Pantano and Fabio Felline could lead the line in the Tour Down Under which suits them both and then Contador and Mollema will take over in Europe. Contador is likely to repeat his schedule with Paris-Nice, Volta a Catalunya and Vuelta al Pais Vasco and he definitely has the potential and consistency to be on the podium in all those races. Mollema will be the leader in Tirreno-Adriatico but with his eyes firmly on the Giro, he may be less competitive than he has been in the past. The Dutchman is also likely to ride the Tour de Romandie but as he has rarely been at his best in his warm-up races, we can’t expect too much here. Contador will again do the Dauphiné while Pantano might get a rare chance to lead the team in the Tour de Suisse where he was close to the podium in 2016. If he doesn’t do the Giro, Peter Stetina should lead the team in California but due to his poor time trial, it won’t be easy to win the race which will probably have a better field in 2017. In the autumn, the team should really back Felline in the Eneco Tour which is a race that he can potentially win. The team will have a big focus on the WorldTour and will probably be less active in smaller races. Nizzolo and Degenkolb will both do many classics and so they won’t be doing a lot of stage races. However, they should still be able to pick up a few stage wins along the way. Edward Theuns will also get a few sprint chances somewhere but the Belgian is not a pure sprinter and not as fast as his two teammates. Felline should be the protected sprinter in races like Pais Vasco and Catalunya and he has been close to stage wins in that kind of races in the past. As most of the team is made up of domestiques, they will be heavily reliant on their captains. However, Matthias Brändle should benefit from his move to a team that has a strong history in time trialling and he could win a prologue or short, flat time trial somewhere during the season. As said, the team will be very focused on their leaders and so it will be hard for the young rider to carve out much space. However, Jasper Stuyven has earned himself a position in the team that should allow him to play his personal card. As said, Degenkolb will probably be the clear leader in Roubaix but in the Flemish races, Stuyven should have more freedom. His domestique role meant that we never got the chance to see what he could do in 2016 but in 2017 he is capable of great things in the hard cobbled races. The team have signed a number of young riders but only one of them seems to be able to achieve results already in the first year. Mads Pedersen dominated the Junior ranks a few years ago and his stage win in the Tour of Norway and 8th place in the 3 Days of De Panne suggests that he is already able to show himself at the highest level. He will mainly work as a domestique for Degenkolb on the cobbles or work in the lead-out trains but he could get the chance to show himself in some of the lumpy races in Belgium somewhere during the year. His fast sprint means that he has the skills to become a winner. Finally, we will highlight Fabio Felline. The Italian can no longer be described as a real surprise but he still only has one win at WorldTour level. He has progressed massively since he joined the Trek team and has become a lot more consistent. Furthermore, his fast sprint, good TT skills and improved climbing means that he is one of the most versatile riders in the peloton. He still has to find out where he wants to focus but if he can continue his progress, the sky will be the limit for the talented Italian.